Embracing life at the molecular level. For math aficionados – March 14, 2015 (03.14.15) is a very big deal – it’s Pi Day! Before you run to the bakery to celebrate – pi is a mathematical constant that you may remember from geometry class. Don’t click off – I promise this gets interesting! First, some background bits: the ratio of the circumference of a circle to its diameter is approximately 3.14159, represented by the Greek symbol “π” and pronounced “pi.” This is universally true for any circle. A boggling factoid about pi is that mathematicians have defined it to over one trillion decimal places, yet the full number will likely never be known as pi is an infinite number. But rather than dwelling on the numerical representation of pi, I ask you to imagine being able to see pi. This happened to Jason Padgett – now an acquired savant in math – after experiencing severe head trauma following a violent mugging in 2002. Before the attack, Jason Padgett was an iron-pumping, mullet rockin’ dude with no interest in math. After the trauma,Padgett now views everything as a myriad of tangents and geometrical shapes; a mathematical world — in real time. When an object moves, Padgett sees the shapes shift and spin as if on a grid. Looking at trees he sees a dance of geometrical shapes and elegant fractals. At first, Padgett found these visions extremely disorienting and a jarring experience. However, over time, he realized what his brain was perceiving — mathematical equations in action — which prior to his trauma were operating hidden in his subconscious! The brain views the world in tiny snapshots linked together like the individual frames of a movie. Recall the early silent films where movement appeared jerky. As film technology advanced, images were knitted closer together until they appeared smooth to our eye. Similarly, our brain sees the world around us in frames, but there is also a smoothing function that essentially fills in the gaps between the edges of what we see. This makes it much easier for us to navigate our surroundings. Padgett lost this smoothing function revealing the raw images seen by his brain. Your unconscious brain does calculus calculations all the time – effortlessly. When judging the distance of the bus coming towards your turning car as you simultaneously notice a child’s ball rolling into traffic, your brain instantly calculates the relationship of these moving items in space, their relative rates, and potential points of intersection (i.e. crash!). The output informs your decision to brake, turn or accelerate. That’s right, your hidden brain – or subconscious – is a mathematical genius! Today Padgett shares his insights with physicists and other scientists to inform their research. 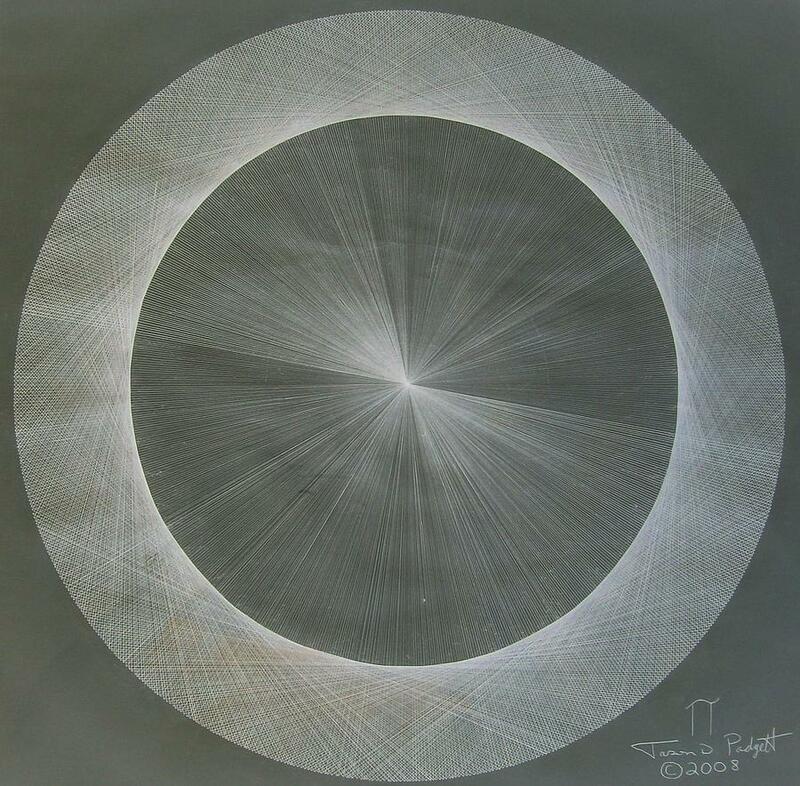 Moreover, he shares his visions through exquisite, freehand drawings revealing stunning manifestations of complex mathematical and physics concepts such as wave particle duality and even pi. Watch here to see him draw the image of pi by hand and listen to him describe what he is seeing. Padgett is also looking at ways to revolutionize teaching math. Children are naturally very receptive to seeing an image and grasping its subtle qualities. If children are exposed to mathematical concepts as visual images at an early age, they are much more receptive to learning the correlating mathematical equations and calculations years later. Padgett’s injury has been lauded as giving him new abilities, but the trauma actually uncovered genius abilities that were there all along. He may have lost the smoothing function in his brain but it revealed the magic underneath. Just like removing the back of a watch exposes the mechanical intricacies of a timepiece, removal of the brain’s smoothing function exposed some of the inner intricacies of the mind. On Pi Day – as we ponder the significance and now the beauty of pi, let’s also reflect on the marvel of the brain. It directs, learns, changes, and calculates based on input from our senses and electrical signals from our neurons. There is much yet to learn about the dynamic brain and the less tangible “mind.” Judging from Jason Padgett’s insights – the discoveries will be breathtaking. End of Pi Found? Comment thread where Jason Padgett proposes to have identified the end of pi based on the physical limits of our universe. Categories: Consciousness, Mathematics, Neuroscience | Tags: Brain, Math, Neuroplasticity, Physics, Pi | Permalink. © 2018-2015 Grounded in Science and Diane Hannemann. All rights reserved. Unauthorized use and/or duplication of this material without express and written permission from the author, Diane Hannemann, is strictly prohibited. Excerpts and links may be used, provided that full and clear credit is given to the author and Grounded in Science with appropriate and specific direction to the original content.